OpenGuru Weblog: I am getting exploded with new blogging ideas! I am getting exploded with new blogging ideas! As you might have seen from the my blog post history, I don’t blog very often. In-fact its been about 3 months since I even visited the Blogger website. When I visited the Blogger website today, I was welcomed by a freshly looking Blogger. 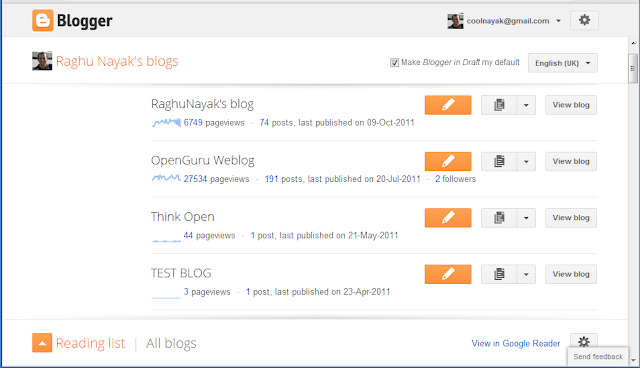 The Blogger’s new look is really nice & it brings fresh air into the Blogging world! I must admit that Google’s blogger team is working really hard. First they brought the new Blogger themes & now they’ve re-designed entire Blogger itself. Though Blogger was late in introducing many new feature, nevertheless they are not too late! Now a days I see Blogger team introducing new feature every month or so. Its just cool! Ever since I started using new Blogger website, I am feeling my self getting exploded with new blogging ideas. Though I am not sure how many of these ideas will actually make in to blog posts, I am in love with the new Blogger website & its features. The Blogger’s new look is a very much welcome move in the Blogging world, where I always felt that Google Blogger is little stagnant with features. Technorati tags: Blogger - New Look, OpenGuru.